Because everyone knows the filling is the best part! Special thanks go to Sue, who gave me the original recipe I modified after I lamented on Facebook about all the recipes I found on Pinteresst calling for either ingredients that aren’t sold in the UK or ingredients I didn’t have. You can use fresh or tinned pumpkin for this (you also could use a butternut squash or sweet potato), though the verdict is still out if tinned pumpkin is syn free. I say it is, because it’s a tinned vegetable (and contains 100% pumpkin), but a friend of mine says it isn’t. So, use fresh pureed pumpkin if you have it, syn the tinned or don’t syn, it’s your choice. 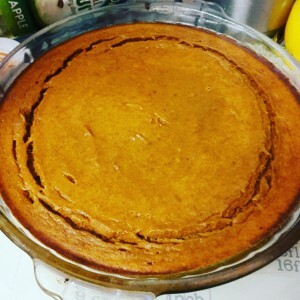 This pie comes in at 2 syns per slice if you divide it into 8 and it tastes exactly the same a the filling in a regular pie does. 1. Preheat the oven to 220C and spray your pie plate with fry light. 3. Pour into the sprayed pie plate and bake for 15 minutes. 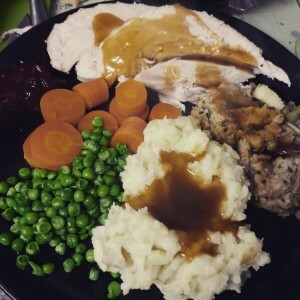 I served this after we had a mini Thanksgiving, or Fauxgiving as I called it.We don’t celebrate Thanksgiving in the UK, so anyone who is celebrating it here today is probably an American or related to an American (or friends with, etc.). Basically, we had a roast dinner with turkey instead of chicken and I added a bit of stuffing and cranberry sauce. I served mashed potatoes instead of the usual roast only because my throat hurts right now and I thought the sharp corners on the potatoes would have hurt going down. I followed the cranberry sauce recipe in the Slimming World Christmas cookbook and made a double batch of it to store in a jar until Christmas (if you turn the jar upside down, it will seal itself). *Truvia for baking is sold in a 500g bag and is amazing to bake with on Slimming World, as it only has 2.5 syns per 25g. You could use regular sweetener, but 75g would be A LOT of sweetener, or you could use sugar, but adjust the syns accordingly. 75g Truvia baking blend is 7 1/2 syns. **If you’re in the US, this is cornstarch, not the stuff you make cornbread with!